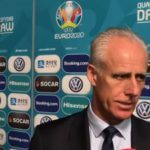 Where to start with the last week in Irish football? 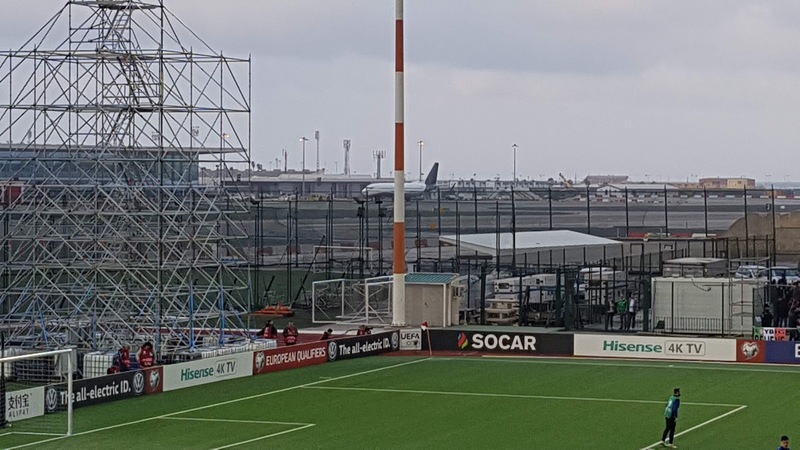 Is it a case that the winds of change that appear to be blowing in the direction of the FAI are of similar strength to the gale blowing across Gibraltar Airport and the Victoria Stadium that reduced Saturday’s game into the realms of farce? Or is this a situation that will blow over with a quick board reshuffle and change of job title? From this fan’s perspective, the start of a new campaign usually offers the possibility of change. New locations to visit and new players to watch are almost always guaranteed and on those occasions when there’s new management that throws another variable into the mix. In fact, the lack of new locations plus a lack of available time off had meant that I passed on the return visits to Wales and Denmark in the Nations League. 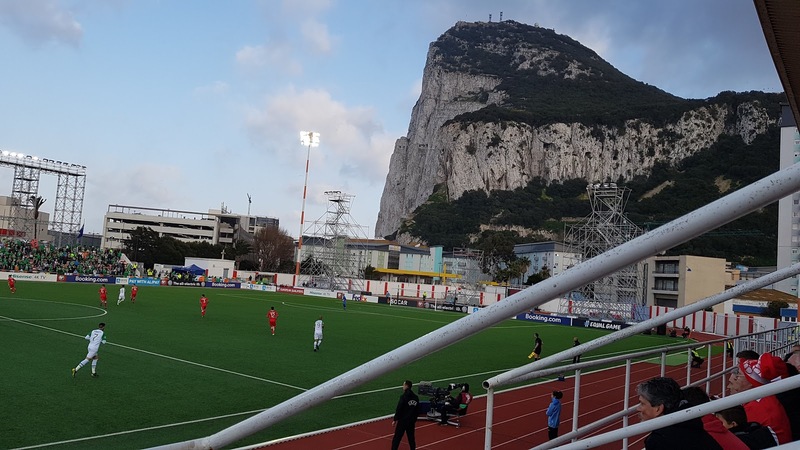 So when the draw for the European Championship qualifiers proper was made, a trip to Gibraltar, a place I’d be unlikely to visit otherwise, was an attractive proposition. With flights to Malaga booked early, the whole phoney war about whether or not the game might be moved to Faro where I’d already seen us play the same opposition in the Euro ’16 qualifiers caused a bit of concern but once the game was confirmed to go ahead on the Rock, I’d been looking forward to getting some Mediterranian springtime sun into the bones. 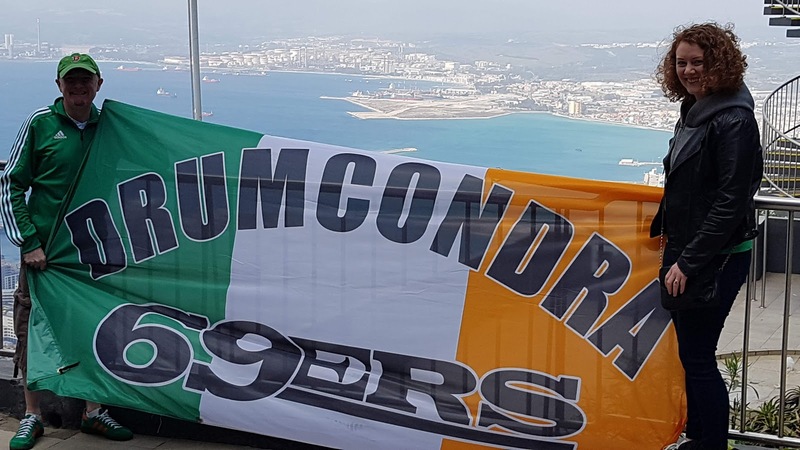 Our flights to Malaga the day before the game went off uneventfully and there’d been a minibus arranged to transport a few other like-minded souls from YBIG that had arrived in through various routes from Malaga down to La Línea de la Concepción, the town on the Spanish side of the border. With Gibraltar still a disputed territory, taxis can’t cross the border so it was left to us to wander across what’s essentially an airport runway in the shadow of the Rock itself to the town once we’d gone through border control. To be honest, once we’d stepped off the bus, I’d already realised that the prospect of that springtime sun was looking remote but by the time we started walking over and got our first blast of the wind that was forecast to hang around for the weekend, I pretty much gave up on it there and then. I’m not kidding, it could nearly lift you off your feet! The road into the town genuinely doubles as the airport runway so it’s as open to the elements as can be and the temperatures that had been in the twenties the previous week were nowhere to be seen. The fact that we were booked to stay on a boat docked in the Marina also added an extra layer of intrigue to our arrival and after meeting a few of our advance guard who’d been making their way from various locations around Europe in a bar called The Ship, appropriately enough, we were shown to where we were berthed and gingerly made our way across a gangplank that seemed very insecure and onto a boat that seemed a lot smaller than the yachts pictured on the website we’d booked it through! 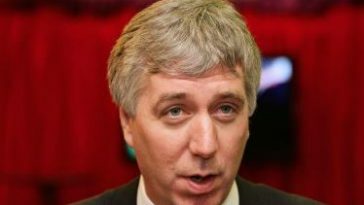 Insecure is a word that could also have been used to describe the position of one John Delaney, the erstwhile CEO of the FAI over the previous week. Revelations that he had taken a trip to the high court to try and prevent the publication of Mark Tighe’s piece detailing a payment of €100,000 from Delaney into the association’s accounts and back again in 2017 had created a storm of another kind which hadn’t abated all week. 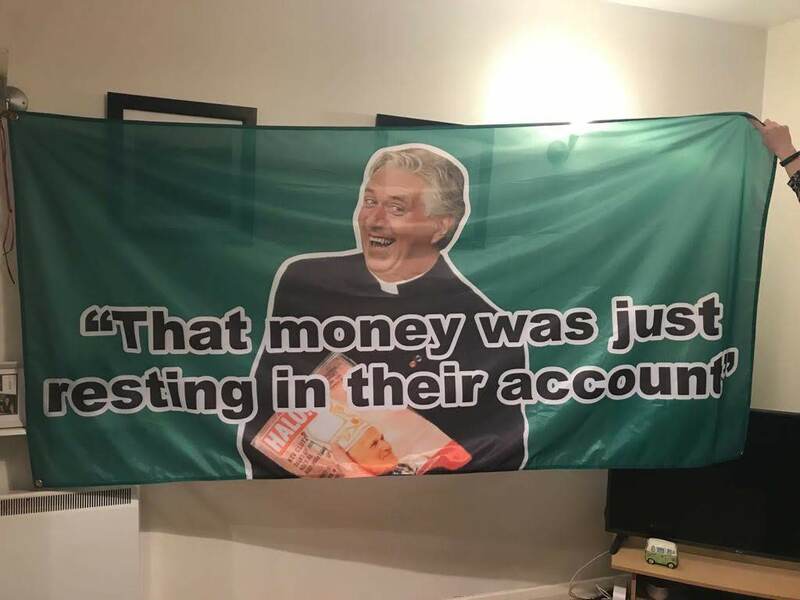 Legitimate questions relating to why an association which had reported a turnover of over €50m the previous year couldn’t source credit of €100,000 through its regular banking sources hadn’t been answered with any clarity by the multiple press statements issued on an almost daily basis by the FAI. Rumours relating to his future had also been circulating all week but exactly what might follow was clear as mud. 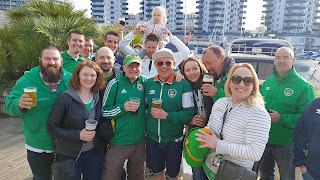 Those issues, along with Declan Rice’s ill-advised tweets coming to light and Jon Walter’s retirement were dominating the bar-room discussions when we made our way back to The Ship with what can safely be called differing attitudes towards each player the order of the day. There was also plenty of general chit chat about the history of the place with some of the locals. There’s an interesting attitude there with a clear dislike of Spain despite the fact that some of the people we spoke to had a Spanish parent. But the attitude to Britan is fairly nuanced as well with more than one telling me that they’d sooner be independent but have to depend on the UK to prevent Spain just rolling them over. 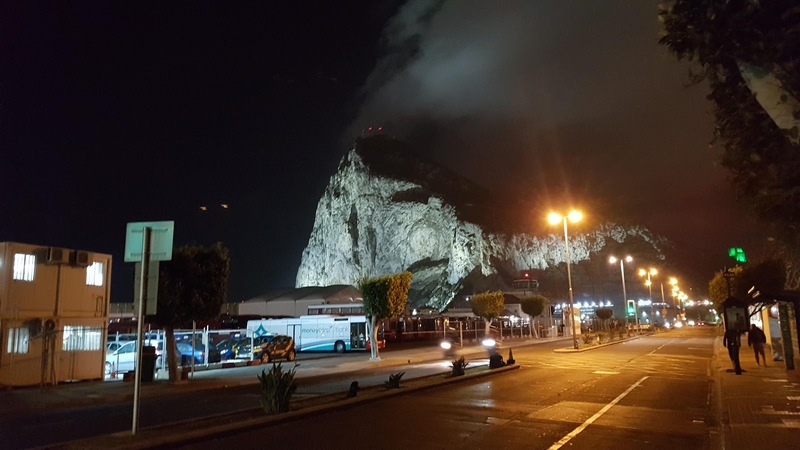 We then headed up to the town to try and find some food and finished off in a local bar for a nightcap before another wobbly trip over the gangway and into bed. With three couples and two kids staying on the yacht (and there’s a whole other story I could write about that boat) and a fairly heavy swell in the Marina, there were more than a few moments where sleep was interrupted by the bobbing up and down and noises of masts and ropes being blown against each other but once we were up, we had the afternoon to take in a bit more of the locality. It’s definitely a bit of an unusual experience to be walking around an area geographically in the south of Spain with orange trees and all the fauna associated with that area visible but to see bright red postboxes and coppers with traditional bobby’s caps on them. Especially when a cable car up one part of the Rock brings you to a wildlife park complete with a tribe of macaque monkeys lording it over the place. As adjectives go, cheeky is an understatement when it came to these characters. In our hour wandering around, we saw an ice cream and a bag of crisps getting pilfered from unsuspecting fans and calmly polished off! Having experienced similar on a visit to the Nagano Snow Monkey Park during the Japan World Cup, the victims of such larceny had my sympathy! Having managed to take in the vista without getting blown off the sides, we managed to safely navigate the cable car journey back down and made our way back to the marina where a fan zone had been set up with big screens for those without tickets to watch the game. The usual faces were present and correct and the 6pm kick-off made a nice change from the more regular continental 8.45. A couple of hours of mingling passed quickly before it was game time and a misunderstanding relating to my request for a media pass meant that my ticket was for the opposite stand to the bulk of the Irish support. A cheeky attempt to gain entry to the East resulted in me being incorrectly told my ticket had already been used which caused a bit of concern but after telling Louise to head in with everyone else, I managed to get in at the other end of the ground and found a spot beside a Gibraltar fan and his family. Team-wise, I was happy enough with the eleven named and the decision to try and accommodate Matt Doherty on the right. As the form Irish player in the Premier League this season, he deserved a chance but dropping the captain for him wasn’t a realistic proposition. Given the quality of the opposition then this should have been as good an opportunity as any to try him there in the absence of any friendlies. I’d thought from as soon as Mick McCarthy was appointed that David McGoldrick would be one to benefit given their history together at Ipswich so it was no surprise to see him named. Sean Maguire has been unlucky with injuries every time he’s looked like breaking through so I was glad to see him get a chance. Conor Hourihane has been in good form for Aston Villa as has Enda Stevens for Sheffield United so both warranted inclusion and the rest of the team looked solid. The team certainly looked good enough to win comfortably. However, looking and doing are two different things and it became clear early on that the conditions were going to play far more of a part than originally thought. The hosts played with the wind and actually started better with a very optimistic shout for a penalty after a Liam Walker shot was blocked by Shane Duffy’s upper body. 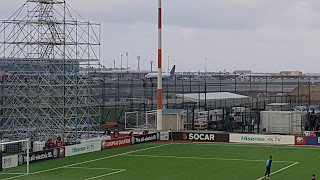 A free kick from the same player that flew over Darren Randolph’s goal soon followed before Ireland got any sort of foothold and the sight and noise of the 6.05 Easyjet flight to Luton roaring down the runway added to the sense of surreality. A couple of Irish chances followed with a McGoldrick show over the bar and a goalmouth scramble finally falling to Richard Keogh but his poked effort didn’t trouble Kyle Goldwin. Every time the ball went into the air the wind was catching it which meant the Irish player’s decisions to make every sixth or seventh pass airborne was maddening. 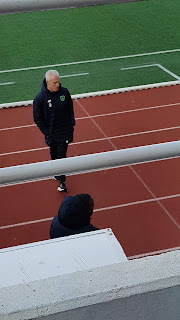 My seat was directly behind the bench and that decision making was clearly infuriating McCarthy on the sideline with regular roars at the players being lost in the gale. 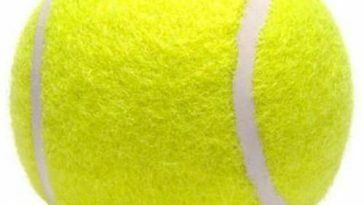 When the ball was kept on the deck there were some reasonable passages of play but nothing really coherent enough to make a breakthrough look likely. This was perfectly illustrated by a McGoldrick crossfield pass around 25 minutes in that seemed to be heading towards Keogh until the wind blew it straight into Goodwin’s arms and another pass aimed towards James McClean that changed direction mid-flight to drift out. With Ireland now dominating possession, a succession of corners followed but even controlling those was difficult with half chances for Doherty and Maguire coming and going and it was actually through a Gibraltar player that Ireland’s best chance arrived. 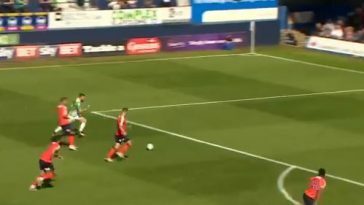 A Coleman cross swirled in the wind and Roy Chipolina lost the flight of the ball leaving Goodwin to go full length to tip his defensive header over the bar. Again, the corner came to nought. Coleman and Doherty were beginning to combine somewhat on the right which was where most of Ireland’s pressure was building unlike McClean on the left who seemed to be having one of those off-nights. Again, he was not being helped by long balls being sent his direction and one of the few occasions he managed to get control of the ball, he had his legs taken by Lee Casciaro who was promptly booked for his trouble. Clearly not satisfied with Casciaro’s punishment, McClean then took the opportunity to exact his own retribution a minute or so later picking up a needless booking just before half time. The whistle for the break swiftly followed and worrying talk started turning to whether this could replace Jack Charlton’s 1995 draw in Liechtenstein as Ireland’s worst ever result. After moving a few rows to sit with a few Irish fans for the second half, our fears nearly came closer to realisation in the first minute after the restart. Gibraltar immediately won a corner from which Roy Chipolina met perfectly with a header. Every one of us thought the net was about to bulge only for Randolph to somehow claw the ball clear. It really was a sensational save from the Bray man and one that turned out to be a game changer two minutes later. It was Randolph again who started the decisive move of the game by weighting a lovely pass to McClean. For once, the flight of the ball was true and McClean took a lovely touch to bring the ball under control before laying it off to Hourihane. Hourihane then played a ball slightly over the top which the wind bent into the box where McGoldrick was escaping the attention of Roy Chipolina. An unselfish pull back from McGoldrick to where Jeff Hendrick was arriving into the box was all that was needed and Hendrick calmly stroked the ball into the corner beyond the dive of Goodwin. One nil Ireland and maybe now the team could push on and put the part-timers to bed. Well, that was the hope but it wasn’t long evaporating as the game reverted to the scrappy nature of the first half before long. 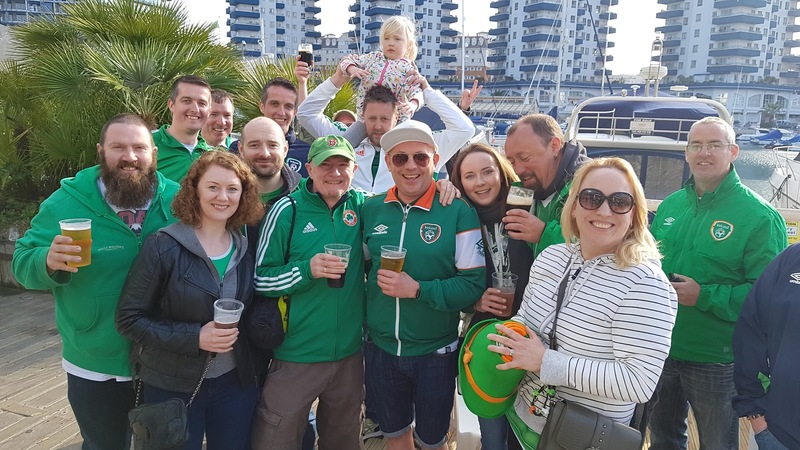 Gibraltar tried to push forward in the immediate aftermath without really creating anything and while Ireland were keeping the ball on the deck a little more, we weren’t really creating anything either. Coleman hit the deck in the Gibraltar area leading to a half-hearted penalty shout but nothing was given. 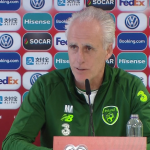 Doherty’s evening ended early as he was hooked for Robbie Brady on 56 minutes with McCarthy obviously deciding that his experiment to shoehorn Doherty and Coleman into the same XI wasn’t worth persisting with. Shane Duffy ended up prone on the ground after a collision with the second Chipolina brother, Joe, during a goalmouth scramble just before the hour mark. Gibraltar tried a couple of pot shots that didn’t trouble Randolph but shouldn’t have been let happen regardless. Sean Maguire exited the fray on 70 minutes to be replaced by Harry Arter. The fact that we were replacing a striker with a midfielder spoke volumes and though McGoldrick moved further forward, we seemed to be settling for 1-0 very early. Another Walker pot shot was blocked by Keogh but that 1-0 lead wasn’t looking particularly secure. A Hourihane corner on 84 minutes was caught by the wind and nearly dropped in but Goodwin punched clear as the threat from Gibraltar’s little spell subsided. Duffy really should have finished things off in the last minute after getting on the end of a Hourihane free. The fact he didn’t, meant the 3 minutes stoppage time were a little nervy but they were seen out comfortably. The best that could be said was that Ireland at least had the win. 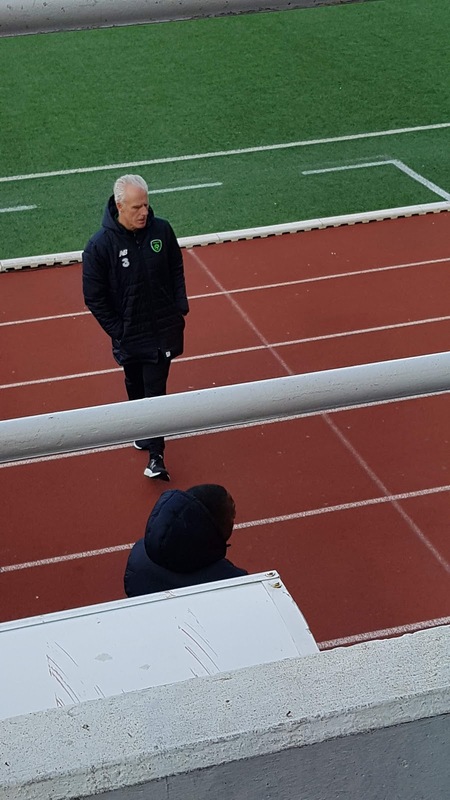 While Mick McCarthy’s second reign had begun with 3 points, it was becoming clear leaving the stadium that the result and poor performance wouldn’t be the main story involving Irish football the following morning. Rumours had been circulating before and during the game that yet another FAI announcement was forthcoming and that this one related to John Delaney stepping down. While nobody really thought that likely, nor did most think that what eventually emerged was likely either. However, it also stated that the FAI would be “creating a new role of Executive Vice-President” and that “the new role of Executive Vice-President would be a specific defined role with responsibility for a range of international matters and special projects on behalf of the FAI. Only this time, rather than disapproving grumbles from the rest of the priests on board, everyone seemed to agree how great John was. Now, to me, that reads eerily similar to a job spec for a CEO role. Precisely what new CEO, Rea Walshe, who is stepping up from her Chief Operating Officer role, is left to do remains to be seen. Such are the vagaries of corporate governance in Ireland, let alone Irish football. Having digested that news on heading back to the marina for some dinner and post-match craic, another Sunday Times story dropped exposing the fact that in addition to his €360,000 salary, a rental allowance of €3,000 per month to rent out a home in Malahide initially before moving to Gráinne Seoige’s house in Wicklow had been paid for three years. While, again, there is no law against companies paying for accommodation for Chief Executives and the payments were declared for benefit in kind, it’s not a good look during a period when other staff had gone through a redundancy and pay cut process. Previous CEO, Fran Rooney confirmed afterwards that he received no such allowance during his tenure. Where things go from here remains to be seen. For us, we spent the rest of the night chatting to some sound local supporters in The Ship before heading up to a late night bar called The Hendrix to take in a couple of hours of the sort of shenanigans around singing and acting the maggot that my younger days on tour used to fully consist of. 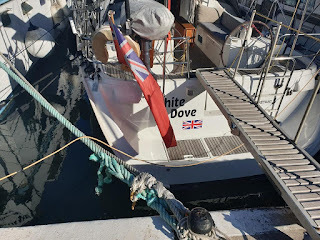 By the time it hit 2.30, enough was enough and with a trip for an overnighter in Malaga the next day in the offing, it was back across the gangway for one last time and a few hours sleep on the boat that rocked. Where things develop on both fronts should become clearer as the week goes on. The team and management, at least, can point to a win and highlight the difficult conditions and lack of time spent working with each other before going straight into a competitive game. I don’t feel that argument holds enough water personally given the opposition but the Georgia performance will tell us a lot more. What happens at board level also remains up in the air but with that Oireachtas Committee hearing due to happen on April 10th, it’s fairly certain that stories will continue to emerge between then and now. Until then, let’s Rock.